Fourth Doctor era, this time from December 2009. 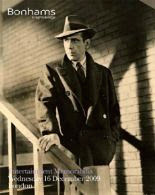 This coming week there is another auction at Bonhams in Knightsbridge of Film and Entertainment memorabilia. Amongst the James Bond and Beatles items (and Laurence Oliver’s costume from Richard III) are a number of original Doctor Who costumes. There is small batch of further items form the Angels costumes archives, containing a couple of Doctor Who lots. The, after a number of film posters and other memorabilia, there are six more Doctor Who lots, though this time not directly from Angels. Star items amongst them is a full Tetrap costume from Time and The Rani. Also on sale is a set of rehearsal scripts form Robots Of Death, which went unsold at the Bonham’s Auction on 16th June 2009, so anther chance to grab them if you meant to bid last time around. The viewing is Sunday 13th and Monday 14th June, so I went on Monday and took some more detailed pictures, particularly of the Tetrap costumes. In the meantime, below is a full list of the items on offer, taken from the online catalogue so they can be seen all together and long after the listing on Bonhams will have been removed. Vampire Guards/ Servants Of The Great Vampire from State Of Decay featuring Tom Baker as The Doctor, first broadcast November - December 1980. 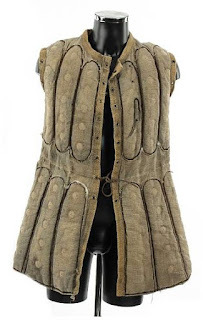 A guard’s tunic, of heavy khaki coloured canvas, with large stud detail to front, laced to back and sleeve seams. 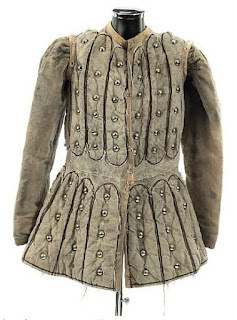 A guard’s tunic, of heavy khaki coloured canvas, stud detail removed and sleeves missing. Thawn’s costume from The Power Of Kroll (1978/9), light blue and light tan diamond-patterned tunic with pale blue braid, gold-coloured stripes to right shoulder, matching belt and trousers, with fake blood, all three pieces labelled with actor's name, Neil McCarthy. 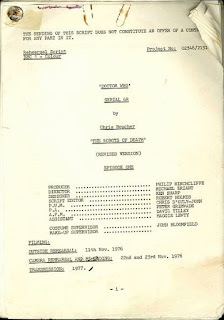 Four Doctor Who rehearsal scripts for The Robots Of Death, November-December 1976, for all four episodes, each comprising numbered mimeographed pages, with details of cast, crew and sets, together with a short typewritten letter to Hilary Minster from Margaret Lewty, assistant to the director, Michael Briant, dated 14th October 1976 and reading: Enclosed are 4 scripts and a friendly note from Peter. Do hope you'll like the part of S.V.7., and signed. Hilary Minster (1944-1999) was a British character actor who appeared in a number of classic TV series, including Z Cars, Tinker Tailor Soldier Spy, Secret Army and 'Allo 'Allo. He did not take the role of S-V 7, but did appear in two other 1970s Dr. Who' stories, Planet Of The Daleks and Genesis Of The Daleks. Dr. Who: a Time Lord robe, the V-neck surplice-style garment woven in pale brown and black diamond pattern, tape ties to sides, with label inscribed FUT 488. Purchased from the Longleat auction in the early 1990s, this is believed to have been used in the Tom Baker story, The Deadly Assassin, transmitted October/November 1976 and Ark Of Infinity, with Peter Davison, shown January 1983. 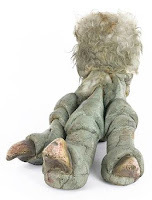 A Shrivenzale foot moulded and painted foam latex with faux fur, approx. 61cm (24in) long. According to information received, this was purchased at the 1983 Longleat auction, together with the other foot. The Shrivenzale featured in the Tom Baker story, The Ribos Operation, September 1978. It is thought that the feet are all that remains of the costume.